It’s been just over a month since the last post on Southbourne Gardens, I think I complained back then that there was not much to see, well what a difference a month makes, especially as we were away on holiday in Portugal for a week of it, suddenly things seem to be changing at the speed of light and it feels as if there is something completely new to see on a daily basis. 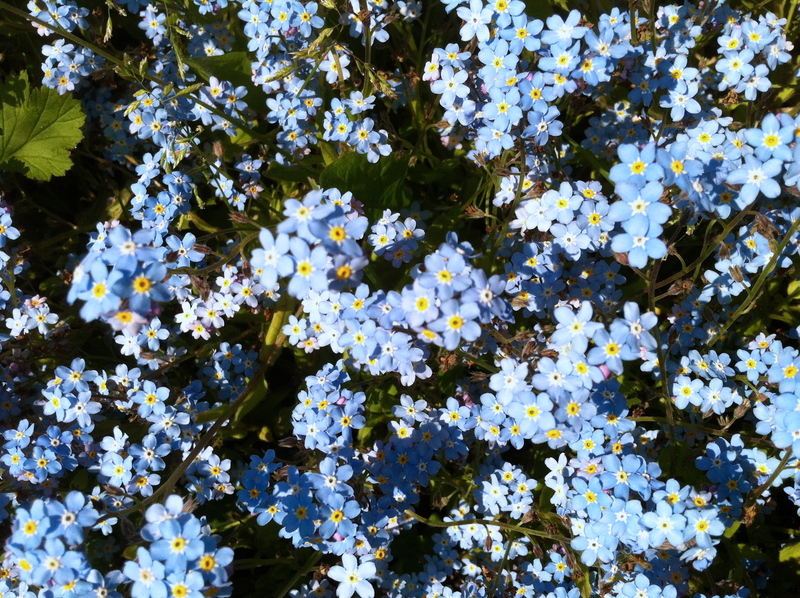 That said it’s the forget-me-nots, Myosotis Sylvatica, considered a symbol of enduring love, that are making me smile most at the moment. Growing in clumps they are dotted here and there all over the site (I think this photograph was taken on Tim and Jane’s plot) looking gorgeous in all their simplicity. If you fancy growing some, now is the time to sow for next year. All the information from the RHS here. Hello Lucy,thank you so much for your kind comments and for taking the time to read and comment. As far as forget-me-nots are concerned because it’s an allotment they are just left to their own devices, I think that’s why there are so many of them all over the site. V.